[dropcaps]T[/dropcaps]he division in device computing is no longer just the battle between PC and Apple, or Android vs Apple. It is now also tablet versus laptop. When tablets first hit the scene, they were a breath of fresh air. Tablets provided a convenient easy carry option and the ability to interact with a touch screen making for an awesome user experience. Like any new product, you have early adopters, new platform haters, and cross-genre copycats. After being around for a few years and the need to push the tablet platform to new levels we have begun to see new fresh iterations of the tablet genre. Further adding fire to the battle of who will prevail keeping users computing experience. 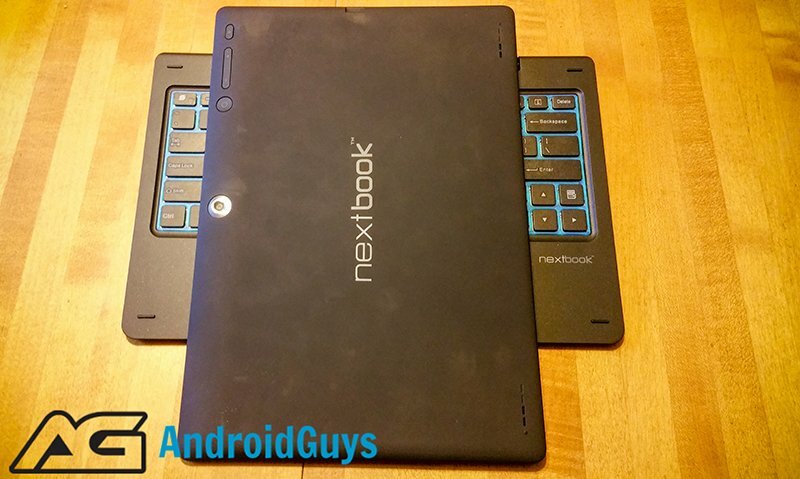 Nextbook has created a hybrid tablet The Nextbook Ares 11 2-in-1 Android Quadcore Tablet. The Nextbook Ares 11 2-in-1 comes preinstalled with Android 5.0 Intel Atom Quad-Core 1.8GHz processor, 64GB of internal memory with a microSD card slot that expands to an additional 64GB of storage. The Nextbook Ares is also equipped with an 11.6-inch screen with an aspect ratio of 16:9 and resolution of 1366×768. Given it is a hybrid, the Nextbook has an additional feature – a detachable keyboard making the device a tablet and laptop combination similar to the Microsoft Surface. I’ve spent the last 15 days using the Nextbook Ares casually some days, and other days forcing myself to use it for all of my computing, social, and entertainment needs. The tablet itself is light weight (2.97 pounds with the keyboard) and durably made of a smooth rubber finish that provides ample grip and feels good in the hand. Even though the tablet totes a huge 11.6-inch screen, and I have moderately small sized hands, I was still able to hold it comfortably and reach all the screen real estate that I wanted to swipe or touch. The button placement is baffling to me being this device is new. The buttons are camouflaged on the back of the device, not along the edges like the majority of today’s devices. In order to access the buttons, I had to turn the device over or peek my head over the screen, to figure out the button’s location. The buttons are nearly flush with the device, and have the same smooth finish as the backing. The button placement makes it difficult to make a selection quickly because you have to first find the placement fiddle with them to make sure it is the desired button then press it wasting time unnecessarily. When you have hunted down where the buttons are located, the buttons are very clicky and respond well. After overcoming being baffled, I assume the thought process of placing the buttons on the back of the device is to prevent possible accidental touches. Although over the past few years, the button placement has been almost standard for today’s devices where you have an up and down volume rocker on the side, and a power button on the side of the device. As a consumer, I have enjoyed that feature because I know exactly where the buttons are located and can easily control them one handed as needed. The tablet packs underwhelming front and back facing 2-megapixel cameras. The quality of the photos are lackluster and grainy, and nearly not worth using. If you are competing with tablets and laptops, you are giving your product a disadvantage as most laptop cameras are now HD quality and tablets are ranging from 4MP and up. If you are going to give a device a 2MP rear camera it isn’t even worth adding it to the device. Attaching the keyboard enables a whole new user experience. 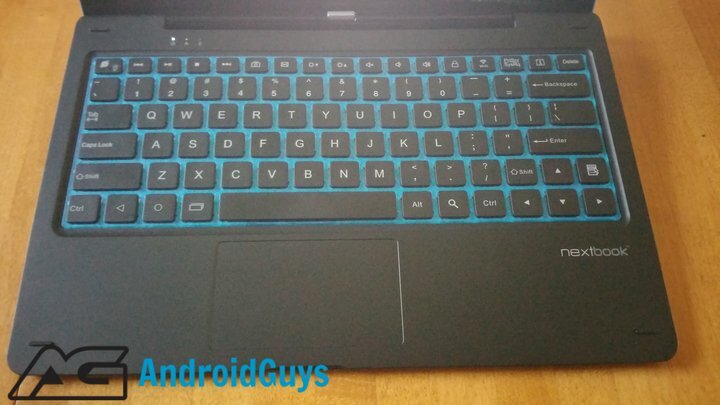 I have never used a touch screen laptop so I was anticipating what I could do with the Nextbook Ares. Attaching the tablet to the keyboard is effortless and clicks in place nicely. The keyboard itself is constructed durably, has a smooth textured finish that also feels comfortable in the hand and looks sleek. The keyboard is a shrunken down laptop keyboard and has top number rows but does not include 10 keys. For the most part when I pressed a function or key with the keyboard it responded intuitively with the tablet. Although I did notice multiple times when I used the keyboard button to brighten or dim the tablet or control the audio with speaker buttons it stopped video playback which I found annoying. Also, the tablet is advertised as back lit which you can enable on or off. The catch is that the keys are not illuminated just the spacing between and around the keys illuminate, so when the room is completely dark you still have to search for the keys due to the fact the keys are black and not visible in the darkness. The keyboard is equipped with multiple useful shortcuts just to mention a few camera, calendar, recent apps, and home button. These quick keys are extremely helpful and keep you from having to go into alternate screens or unnecessary move your hands off the keyboard. Keeping your hands on the keyboard is important because even though you have a keyboard you will have to go through a learning curve on how to use it accurately if typing with proper hand placement. Compared to a laptop keyboard the Nextbook’s keys are undersized and can be difficult type two handed naturally with their smaller stature. Playing games and watching video content is enjoyable with the multiple viewing angles provided, with being able to adjust the screen viewing angles while attached to the keyboard. On the other hand, the screen resolution leaves much to desire. The Nextbook Ares screen does not get very bright enabling a flat pixelated screen that lacks definition and color. Be prepared to use headphones or a bluetooth speaker to actually hear the audio from the Nextbook Ares – the speakers are located on the back of the device the audio quality is muffled and low. It would have been nice, that once connected to the keyboard that you would gain added bolder louder speakers that are on the keyboard. The Nextbook Ares 11 2-in-1 is a good entry level tablet/laptop for young children that are just getting introduced to laptops and is a good transition to having their own device. Since most young children already have experience using their parents cell phones and tablets. The Nextbook is also great for older adults who don’t want to spend a lot of money on a tablet or laptop but need something cheap to use for emails, quick document creation, or streaming digital content. The Nextbook Ares is also great for an alternate tablet/laptop option for traveling or just office usage due to the fact it’s price point is only $197 at Walmart. The Nextbook Ares 11 2-in-1 hybrid features a budget-friendly price point and it makes it an attractive device. Although the device has multiple cons I was able to overcome them and enjoy using the device. I found myself using the device more than my Samsung tablet due to the convenience of the Nextbook Ares keyboard feature. The Nextbook Ares 11 2 in 1 doesn’t do any one thing particularly great, but the size, keyboard, price, expandable memory, and 64GB internal memory makes for a heck of a deal. 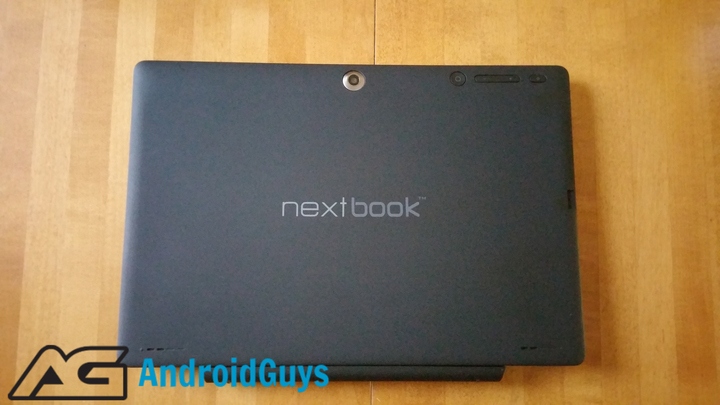 If you’ve liked what you’ve read about the NextBook Ares 11 2, be sure to let us know what you like about it below, and you can grab it from Walmart for only $197. Android enthusiast, photographer, videographer, Comic Book geek and love to create art!